Take any woman who wears the hat of a wife and mother (or grandmother) and then add Christmas to the mix and, well, the last thing you’ll probably get is a woman with a gentle and quiet spirit. But I’m gonna keep trying because I do believe it is possible! And each year I’d like to think I’m drawing closer to this ever elusive countenance. Because I want more and I need more. Not more gifts or more parties, but more of my Savior because I’m a messed up, broken woman who so desperately wants more of His presence in my life. I want to be fully aware of my Savior’s presence during this sacred season but many times our busyness, our need for perfection, our desire for control, and our pursuit of all things on-sale, just pushes Christ right out of His own manger. The spotlight is no longer on Him but rather on things where moths and rust destroy. And somewhere along these lines, my loving attitude goes right out the window. I want to be like Mary who sat at Jesus’ feet, but the reality is, I also need to have the hands of Martha. My pursuit this season, as well as every season in my life, is to learn to reconcile these two. During the Christmas season, what is it in your life that calms your spirit? Shopping during Black Friday? For some, this may be an enjoyable experience. For others, not so much. If this is you, then I’d recommend choosing the calm over the savings. Attending parties? How well does this activity bode with your personality? Are you an introvert who recoils at the idea or an extrovert who can’t get enough of social interaction? I’m split pretty well straight down the middle but my Beloved is more of an introvert, so we choose our parties wisely. Are you a spender or are you frugal? Sit with your man and budget accordingly so things don’t get out of hand with your pocketbook. No money this year for Christmas? No worries. This is actually wonderful and I’m speaking from experience. Since there’s no money, there’s no shopping. No hassles. No waiting in long lines. No fretting over what to get Uncle Bob, etc. Simple as that. Although my mama’s heart hurt deeply during these seasons, Christ is always sufficient to meet our needs and minister to us (and our children) when we’re unable to do so. Do you do things because you feel obligated? Like making Christmas cookies because you’ve done so every year but now you’ve come to loathe this task? I know when I loathe doing something it’s generally a lot more difficult for me to have that gentle and quiet spirit. Make of list of things you enjoy doing and things you don’t care to do (and I don’t mean like doing the dishes or cleaning toilets!) but those added tasks during Christmas. Cross off the things that leave you feeling frazzled or things that rob you of your joy. Instead, replace it with things that will draw you deeper into the presence of Christ. This could be something as simple as sipping hot chocolate while decorating your Christmas tree as you’re listening to Christ-centered Christmas music. 🙂 Music focused on Christ happens to usher my Savior right up to the door of my soul. It’s a beautiful thing when a soul is calmed, comforted, affirmed, and reminded of Jesus Christ, as well as what He did for us. How He walked this earth only to serve us and then ultimately, to die for us. Pursue these type of activities, whether it’s a gathering with some of your Christian girlfriends, or teaching your children the true meaning of Christmas, or even ministering to others in Jesus’ name. These pursuits will look different for each woman and each marriage so find out what works for you. One thing I have learned over the course of my marriage is that I set the tone in my home. So if I want a Christmas that is focused on Christ, then I need to be focused on Christ. And the more time I spend seeking my Savior, the more of a gentle and quiet spirit I will have during this glorious season. 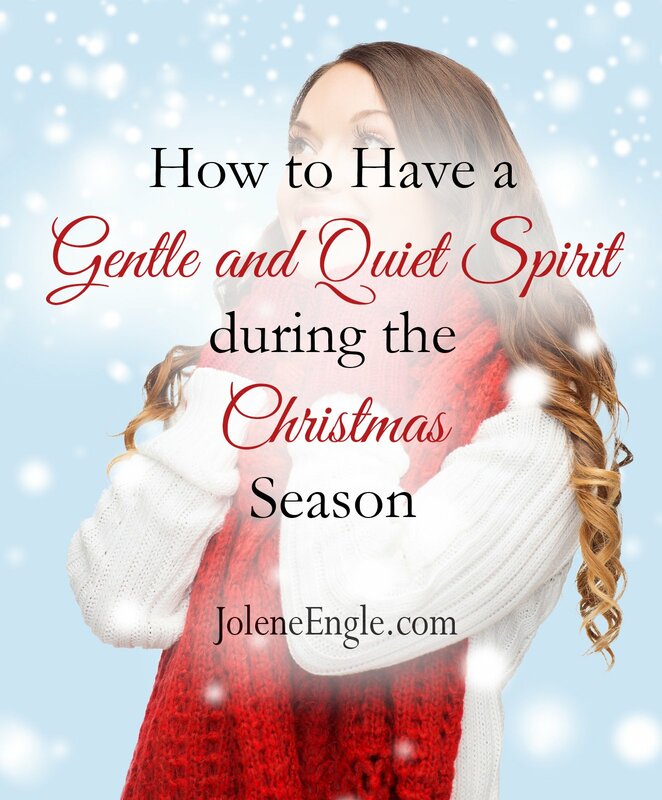 Because Christ has come…and I want to see Him and breathe in every aspect of who He is, and in order to do so, I need to slow down and pursue that gentle and quiet spirit. And yes, this is truly possible when we’re pursuing the Prince of Peace! I like your suggestion of doing more of what builds you up and less of what leaves you frazzled! We all get to choose how we spend our time! Thanks Cassie. You are right about how we get to make the choice of spending our time! Thanks for this post! It’s a good way for me to start in on my study of having a quiet spirit from the Bible. It’s all about where our focus is. You are welcome, Amanda. Happy to hear it blessed you. It’s funny how all of our Christmas celebrations can push “Christ right out of His own manger.” I’ve been thinking lots about how we normally do Christmas, and we’re trying to make this year different by stripping away the distractions until we can really figure out what Christmas should look like. Thanks for the encouragement to draw close to Jesus with a slower pace.